“Mad Max: Fury Road” is a return to the “Mad Max” franchise that established Australian George Miller as an acclaimed director, and Mel Gibson as an international star. The first “Mad Max” movie, released in 1979, featured a post-apocalyptic setting in which Max, a former policeman whose family had been killed, faces off against a biker-gang. It spawned two sequels: “The Road Warrior” and “Beyond Thunderdome,” in which Gibson teamed up with Tina Turner. Miller returns to the franchise that made him famous in the current “Fury Road.” Miller either expects his audience to remember the sparse plot details of the original, or doesn’t care. 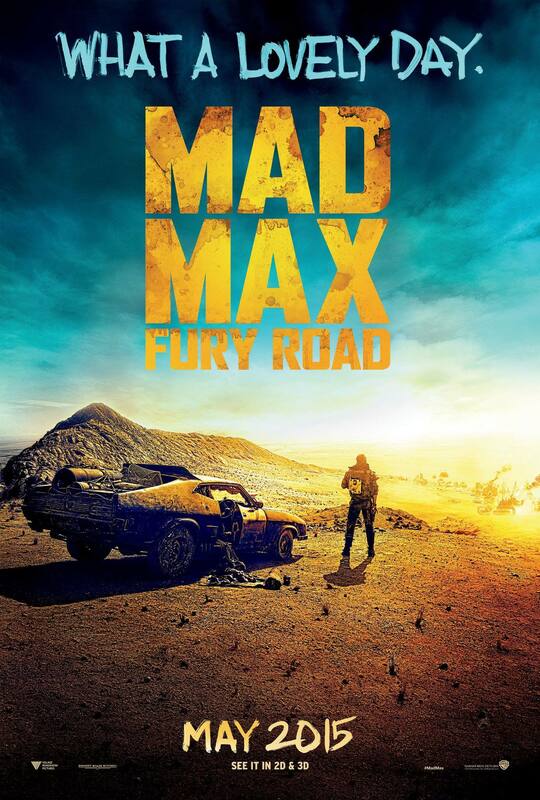 “Fury Road” is low on plot elements, and is basically one long chase movie. In this outing, women are enslaved by men in the post-apocalyptic world. Having had enough, Imerator Furiosa (Charlize Theron) breaks out of the pack of trucks (don’t ask me where they were going) and heads off on her own, with a group of women with her. Furiosa seeks out the Green Place, a peaceful area where she was born, to take the women. Max (played by Tom Hardy) joins up with the women. After they get so far, they decide that they would not be able to make it to the Green Place across endless salt dunes. So Max convinces the women to return to their starting place. So they go back against the army of trucks filled with weapons and evil, noisy men, to return to their starting place. That’s basically the plot of the movie. In a way, it’s like a massive Road Runner cartoon. At times, the outrageousness of all this is rather entertaining. The Bad Guys are accompanied by a group of drummers and a heavy-metal electric guitarist to get them revved up. In the very sparse dialogue, there are references to redemption and self-sacrifice in all this. There’s a touching moment when Max saves Furiosa by giving her a transfusion of his own blood. Messianic overtones do exist in this world. When a young man who sides with Max and the women mentions prayer, Max asks who he prays to. “Anyone who will listen,” says the young man. The screenplay, co-authored by Miller, has its moments. The best thing about the movie is the stunning cinematography of Oscar-winning cinematographer John Seale. He brings out the colors of the desert: burnt yellows, but also the night time blues and greens. Seale gives the movie a distinctive and beautiful look. Of course, this is a violent world, and the violence is onscreen. However, the movie is not as violent as I feared. Like most of the film, things happen very fast, so the violence is not dwelt upon. Hardy looks grim and determined as Max. Theron, who looks like she’s modeling Signourney Weaver’s shaved-head warrior woman in “Aliens” (which was a lot more fun) looks grim and determined as well. No one smiles much in this movie, except with sadistic glee when someone is killed! If you’re interested in seeing the movie, I’d suggest you read up on it, or see the original first. Otherwise, I doubt that it will make much sense. But then, “Mad Max: Fury Road” is not so much about the plot making sense, as it is about the thrill of the ride. Several critics have compared it to a huge two-hour video game, complete with lots of explosions. If this sounds intriguing, this movie is for you!